23 Oct 2018 --- New research from Medical University of Vienna and the Environment Agency Austria has found particles made of polypropylene (PP), polyethylene-terephthalate (PET) and others in human stools. Presented at the 26th UEG Week in Vienna, the results show that every single stool sample tested positive for the presence of microplastic and up to nine different plastic types were identified. Although the study was small in scale – comprising eight participants from a number of different countries in Asia and Europe – it points to the presence of microplastics in the human food chain. The environmental impacts and presence of microplastics in common consumer products have made headlines this year, with the World Health Organization (WHO) in March launching an investigation into the potential human health risks of microplastics after plastic particles were found in the water products of 11 leading brands. Although solid scientific data on the health implications of the presence of microplastics is at present lacking, they may impact human health via the GI tract where it could affect the tolerance and immune response of the gut by bioaccumulation or aiding transmission of toxic chemicals and pathogens. The current pilot study was conducted with eight participants from Finland, Italy, Japan, the Netherlands, Poland, Russia, the UK and Austria. Each person kept a food diary in the week leading up to their stool sampling. The researchers report that the diaries showed that all participants were exposed to plastics by consuming plastic wrapped foods or drinking from plastic bottles. None of the participants were vegetarians and six of them consumed sea fish. “This is the first study of its kind and confirms what we have long suspected, that plastics ultimately reach the human gut. Of particular concern is what this means to us, and especially patients with gastrointestinal diseases,” says lead researcher Dr. Philipp Schwabl. To fully understand the pervasiveness and implications further research is warranted, Schwabl tells NutritionInsight, adding that he would like to perform a worldwide study, with samples from across the globe, not just Europe and Asia. “While the highest plastic concentrations in animal studies have been found in the gut, the smallest microplastic particles are capable of entering the bloodstream, lymphatic system and may even reach the liver. Now that we have first evidence for microplastics inside humans, we need further research to understand what this means for human health." 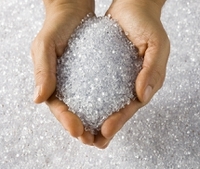 Global plastics production has increased substantially from the 1950s and continues to grow every year. For their many practical characteristics, plastics are pervasive in everyday life and humans are exposed to plastics in numerous ways. It is estimated that, through pollution, 2 to 5 percent of all plastics produced end up in the seas. Once in the ocean, plastics are consumed by sea animals and enter the food chain where ultimately, they are likely to be consumed by humans. Significant amounts of microplastic have been detected in tuna, lobster and shrimp. Beyond that it is highly likely that during various steps of food processing or as a result of packaging food is being contaminated with plastics. “Microplastics have been found in tap water, bottled water, fish and mussel tissue and even in beer. We will also be exposed to particles from house dust, food packaging materials and the use of plastic bottles. It's therefore inevitable that at least some of these things will get into our lungs and digestive systems,” he says. You can read about Professor Alistair Boxall's research into microplastic studies here.